A: It shot 1000 rounds in a row without a malfunction. B: Kimber sent me one to evaluate. I’m still not sure myself! 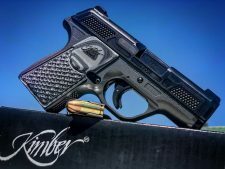 I’ve given Kimber a pretty hard time over reliability issues with guns that they expressly market as defensive tools… so, I was skeptical when an insider told me last year that they were working on something new that I was really going to be impressed with. Even after I held one at SHOT Show and discussed the new model with them at IWA, I was skeptical that I’d actually get my hands on one to test out. To be fair, I wouldn’t blame them if they simply chose to let me bump into one at some point rather than provide one of their most outspoken critics with a sample. Thankfully, they trusted my ability to be respectfully irreverent and give the new pistol an honest test & evaluation. One showed up at the Eastern HQ last week. 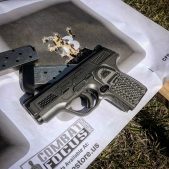 If you aren’t familiar with the Kimber EVO, it is a subcompact 9mm striker fired pistol with an alloy frame. There are four trim levels available, the nicest of which is the EVO SP Custom Shop model, the one they sent me. It is about an ounce lighter than the other three models, comes with solid TruGlo night sights, two 7 round magazines and, in my opinion, is the best looking of the four models. The stipling, multi-tone gray color scheme and G10 grip inserts all look very cool. The gun feels good in the hand and the size, shape and weight make the gun easier to shoot than many of its categorical competitors in the small single stack 9mm world, including polymer framed striker guns and micro-1911s. The trigger is a little on the heavy side at 6-7lbs, but its travel distance is short for a striker fired gun. It has a loaded chamber indicator and you can see the striker clearly at the back of the slide when it is cocked. Deryck Poole. 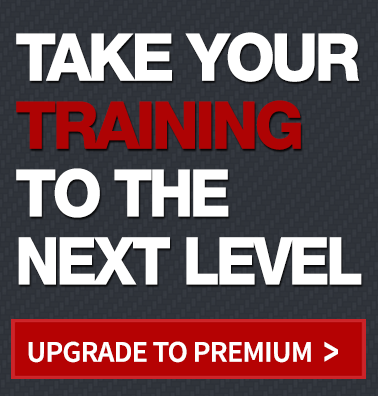 co-host of PDN’s Training Talk, was one of the first to shoot the Kimber EVO with me… straight out of the box. 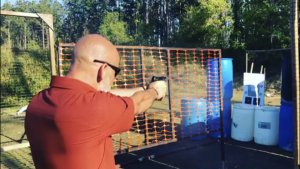 I knew that I was going to want to document the experience I had with the pistol and that ended up meaning lots of video, lots of other instructors shooting it with me over the course of a busy few days and a couple of LIVE Social Media Broadcasts. The first LIVE event was actually the very first shots I put through the gun. I was joined on the range by Chuck Usina, Don Edwards and Deryck Poole to fire the first ball and hollow point rounds through the gun. I couldn’t have asked for a better group of trusted experts to have out there with me, regardless of which way the “first shots” went. Don is a former Green Beret, PDN Contributor, CFS Instructor, and well established Gear Guy. Deryck is also a CFS Instructor, former Marine, one of the new hosts of PDN Training Talk, and a known practical minimalist when it comes to defensive firearms. Chuck is one of my best friends, the owner of Ancient City Shooting Range (my home range), a great shooter, instructor & gunsmith, and the kind of guy who can pull off appreciating 1911s and striker fired guns at the same time, while relying on a flat-backed Lone Wolf framed Glock as his primary defensive handgun for the last many years. You’d be hard pressed to find a better group of guys to give an honest first impression of a would-be defensive pistol… and, we all were surprisingly impressed with it. Most importantly, it worked. Straight out of the box, no cleaning, no lubricating… with a mix of ball ammo and Winchester SilverTip hollow points. At least 10 shooters had fired rounds through the Kimber EVO by the end of the day on Monday… and it was over 500 rounds without a hiccup. Over the next couple of days, we continued to shoot the gun while running the first few classes of the 2019 PDN Training Tour. I let several students try it out and it continued to perform well. I continued to be very impressed. 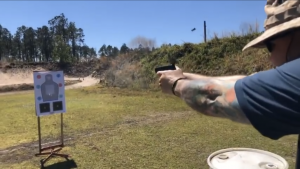 As of yesterday afternoon at the end of the Armed Home Defense class, it had reached 500 rounds without a single malfunction… and that warranted another Video Update. Today was an admin day on the tour… I had a lot of work to do, but that included a lot of time on the range zeroing a couple of new optic set ups on long guns and testing a few different guns. Don, Chuck and I were joined by our other PDN Training Talk Co-host, Barret Kendrick, in shooting another 400+ rounds through this amazing little Kimber… and we got to 1000 Rounds this evening. Again, I did it LIVE on social media. <<– Check out that video! I haven’t done very many “1000 Round Reviews” in my life. I honestly can’t remember any other attempt to do one that went so flawlessly. That is really saying something. I am very impressed Kimber EVO. The example I have is a great gun. I’d carry it for defensive use. I wouldn’t be afraid to trust it to protect myself or anyone I care about it in a defensive situation. That’s something I never thought I’d be able to say about a stock Kimber. I look forward to seeing and shooting more examples of this model on the ranges and hope that the results are similar!